Finally, all WordPress users can put a smile on their face because Teslathemes, one of the premium theme providers, have answered your prayers. The young, Polish-based developers have come up with modern, stunning themes (over 25 in number; more are coming) that are full of premium features and FREE premium support. For all your portfolio, blog, business, creative agency, design studio, e-commerce sites, etc., you can count on the Teslathemes to make them attractive and organized. As you know, the first step to selecting a theme for your site is looking at various factors- like the ease of use, functionality, support, documentation, pricing. Let’s take an eye on these factors (plus much more) in our detailed. One of the main things you should ensure you check before buying any theme for your website is its ease of use. Personally, this is a must check factor…I don’t want to spend over 4 hours understanding the different options in a given theme just to learn how to do a simple task like changing the background color. For the Teslathemes, I believe they’re pretty easy to set up. That’s mainly because they’ve limited the number of options to only the major things you’d want to adjust- like the background, header, favicon, and so on. Thumbs up to Teslathemes for leaving out the smaller themes that make us waste tons of hours fiddling with unnecessary options! Unluckily, I noted that users who are not well versed with the CSS might have challenges using this theme because they might not be able to change H2 text size or color via the option. But if you know a bit of CSS, you’re ready to run the theme. You can’t help noticing all the loads of built-in functionality that Teslathemes have come up with. Content generation features (e.g. shortcodes,), custom post types are some of the amazing functions you’ll find in these themes. Apparently, this is an excellent approach that will help you keep most of the theme functionality that you’ve applied to your content- even when you decide to switch to other themes. However, from my experience, I believe that if you choose to move to another theme or framework from a different designer, you’ll have to revisit your content and make lots of changes to it. 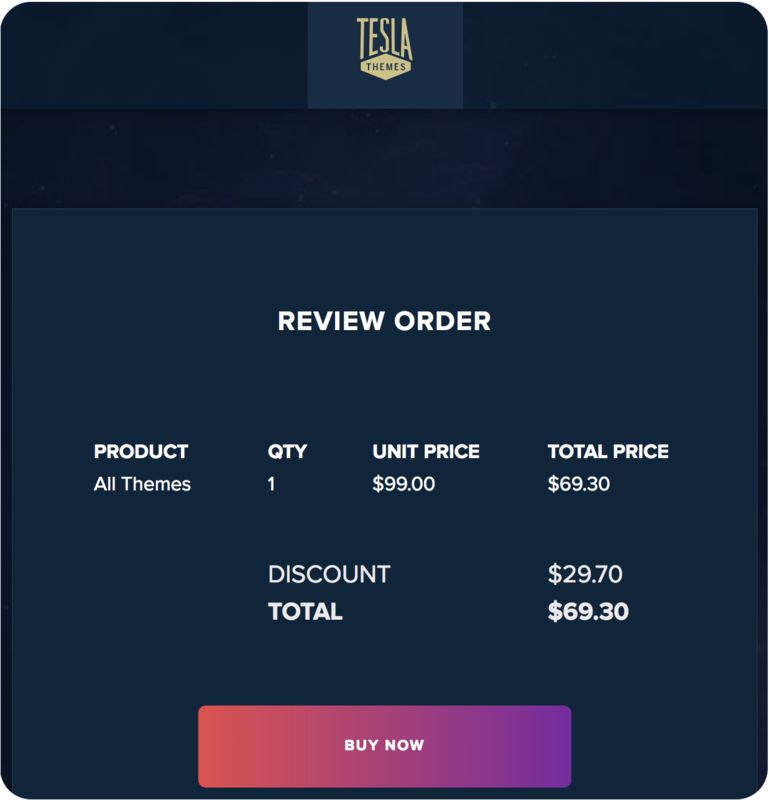 I mention the custom post types as one of the premium functionalities of the WordPress Tesla themes. While it’s useful for making posts for features like the gallery, sliders, portfolio management, team profile, and so on, they’ve been highly criticized. It would have been better if they were provided through a plugin so that they’d easily solve the problems associated to theme lock-in and data portability. All the Tesla themes allow you to use your favorite SEO plugin. They support all the SEO plugins, which takes them step ahead of most of the theme providers. However, it’s good to note that you might have to do some minor fixes when adding these plugins, depending on the theme template you’re working with. It’s also interesting to note that the themes come with integrated SEO option for all your pages and posts. And oh! You can as well add Meta elements to improve your SEO technique with this theme. You have my assurance- Tesla themes are fully responsive! Sites using these themes look great and beautiful when access through any device you can think of- from laptops, desktops, tablets, or smartphones. Considering that most web users use their smartphones to access your site today, this is a must-have feature for any theme you plan to install on your WordPress site. And we can only be grateful to Tesla themes for making it better! Are you ready to get access to these fantastic WordPress themes right now? Good, to do that, you’ve got a few pricing options to pick from. If you’re a developer and you buy this theme, you’ll enjoy all the goodies in the starter pack, plus all the 67 current themes, and over 18 new themes every year. Then we have the lifetime pack which gives you access to ALL the items in a developers package, in addition to ALL PSD files and a Lifetime Access! Isn’t that an exact definition of a Mighty Deal? For the few months I’ve used Teslathemes to run my photography website, I can comfortably assure that you this is one of the most secure themes you can get today. The Tesla team understand that the easiest way to give hackers access to your websites is running an outdated theme. They, therefore, ensure that all their themes are always updated (in fact, they’ll send you free weekly updates, and quickly notify you of the same). Now that the providers have done their part, you also need to do yours to keep your site safe. That is, implement the updates as soon as you get them, as hot as they hit your notifications tab. Besides, the theme developers advise you to keep off shared hosting as much as possible, as it may make your sites vulnerable even when you update your theme as necessary. Let’s face the truth- we all love using up to date products- and WordPress themes aren’t an exception. With that in mind, the Teslathemes team promises to make constant updates to all their themes to keep them at their best (and offer you up-to-date services). With constant updates, you don’t have to worry about the notorious theme bugs as they’re effectively ironed out. What’s more, the regular upgrading process ensures that the themes are compatible with the WordPress core latest versions. As a subscriber, you’ll get notifications of the theme updates ASAP, to ensure your favorite design is always up to date. After subscribing to the Teslathemes club, you’ll get full access to the developers’ four top support channels, namely email, documentation, frequently asked questions, and forums. If you’ve not yet subscribed to their themes, you’ve not been left out either. You can easily browse through the forums (they give you a read-only access) so that you can get firsthand information on the main issues experienced by the users as well as the level of support offered. Needless to mention, this gives you a good indication of how these premium themes are supported. Each of the themes come with a complete user documentation in the downloadable zip archive…when I say complete documentation, I mean it offers you an overview of each theme, a handful of annotated images (useful when trying to look for a given option), and even full instruction on how to install/run each theme. In other words, you’ll enjoy local/offline support with Teslathemes- smile! All the Tesla themes look great! They’ve fresh, modern, and up-to-date designs which explain why thousands of WordPress site owners rely on them to run their websites. They’re also incredibly easy to use, with loads of functionality, and support all SEO plugins. They’re fully responsive, so your site can be accessed on all devices, including smartphones. With both online and offline documentation and support, all your queries regarding the Tesla theme will never go unsolved. Surprisingly, these themes come with reasonable pricing that surpasses their premium features and functionalities.